Magic Quest is an Action, Casual and Strategy game for PC published by Stereo7 Games in 2016. Hordes of enemies are preparing for attack! Your heroes are ready to defend against them. But they need a brave leader like you to lead them in the battles. Will you be able to defend successfully? First, You need to build your defensive towers. They can be really effective on your defending process. Enemy team includes lots of dangerous creatures like goblins and orcs. Each one can make a huge amount of damages on your defensive towers. You can choose the places of the towers by yourself. It’s good to cover all the environment with them. You have some treasures in the village that should be protected hardly against the invaders. It’s also possible to collect new treasures by finishing the levels. Magic Quest has different kinds of environments. You should use a unique plan for each environment. A defensive plan won’t be enough for all of them. So, Your creativity is so much effective in your succession. The player can use magical forces to defend better too. All of your forces are humans. If you want to use them in the battles, It’s better to improve their skills and abilities. 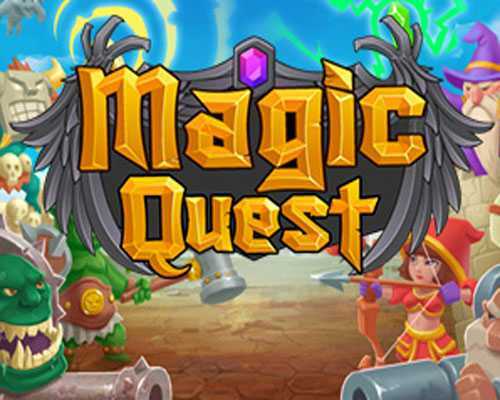 If you’re a fan of Tower Defense genre, Magic Quest will be a really great choice for you. It can be funny for lots of hours. Although it’s a Casual game, There are some levels that will put you under pressure to finish them. Some of the levels are a bit hard to be completed. 3 Comments ON " Magic Quest Free Download "
Look at the file size.